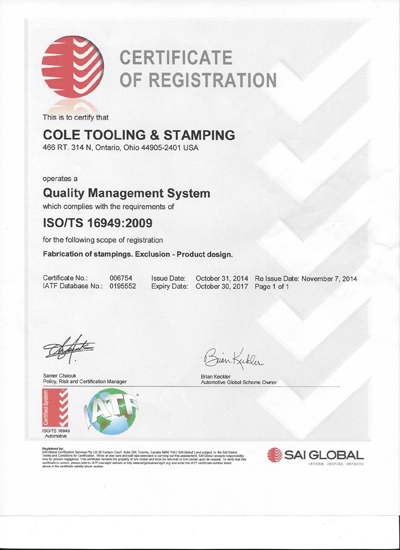 "Cole Tooling & Stamping is committed to comply with requirements for quality to achieve customer satisfaction, and provide a safe workplace by continually improving internal process"
Cole Tooling & Stamping broad range of equipment and experience in complex die stampings enable us to produce many different sizes and types of stampings. We are equipped to handle even your heaviest materials. Complete prototyping and die building capabilities. Press bed sizes up to 61" x 144"
Our Engineering Department is equipped with SolidWorks (CAD Software) and GibbsCAM (CAM Software). We have the ability to open STEP, Parasolid, IGS, .dxf, .dwg, PRO-E, and Solid Edge. We track all tooling projects internally using an in-depth timeline and PPAP process, to ensure outcome delivery and customer satisfaction. All die designs are completed in 3D. Quality has been the focus of Cole Tool & Die since Floyd Cole started the company. That focus has continues through three generations of Cole family ownership. Certified ISO-9002 in 1995 and QS-9000 in 1999 and now currently certified in ISO/TS16929. 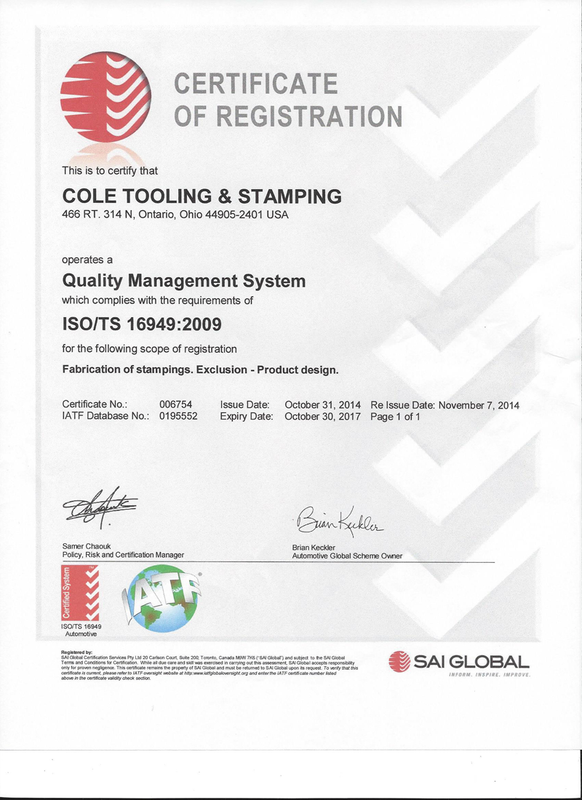 Cole Tooling & Stamping is lead through a cross-functional team by the Quality Assurance Manager which strives to meet or exceed or customer's expectations. The Quality department is staffed with a QAM, QE, and QI's which is constantly monitoring the QMS to continually improve our internal processes. Cole has the abilty to make all your robotic welding requirements, as well as spot welding. Cole Tooling & Stamping specializes in all sizes of heavy metal stampings and assemblies. With up to date technology and knowledge we are able to meet our customers' needs at a cost effective price. With onsite Engineering and experienced Toolmakers we are able to maintain dies in house and continue to produce a good quality product and on time deliveries. Cole operates 8 presses ranging from 200 to 1,000 tons. Currently, we serve the Automotive, Heavy Trucking, and Construction industries. 0.020" to 0.50" Material Thickness and Max coil width of 53.3701"
We offer a wide range of Machining Services from production machining to manufacturing replacement die components. We have CNC Equipment and conventional equipment to meet all your requirements from long-term to short-term machining to surface machining. Our Tooling Department is staffed with experienced Stat Certified Journeyman Tool & Die makers. We have the ability to build new tooling, prototype tooling, and engineering changes to existing tooling. More information on the company can be found below if you click "read more"